Imagine being in the audience when the first of the moving pictures were seen. How utterly astounded that audience must have been. The black and white, silent flickering screen, a new view on the world what was to become known as Going to the Pictures. The environments of the cinema were often quite opulent and luxurious, and coming into the cinema from the cold sometimes gas lit houses at the time provided a place of affordable luxury to escape. Today the Pictures still continue to astound and amaze the audiences with breath taking cinematography and stories, screened with digitally enhanced creative effects and stereo surround sound, and still provides a place to escape into the world of film and away from the hum drum of daily life. This website contains memories of Going to the Pictures from the 1930′s to the 1960′s period, regarded by some as the golden age of cinema. the memories give us an insight into the important role that cinemas played within society. The role that cinema has played in modern society cannot be underestimated. The influence of film in helping form opinions and fashions can be seen and demonstrated through the decades. The moving images would enhance the news and gave viewers a means to see what was going on in the world. 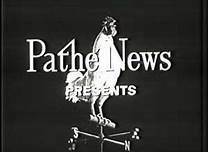 The main types of newsreel shown within cinemas were the Pathe newsreel heralded with the crowing cockerel at the start and British Movie Tone News. In 1886 Societe Pathe Freres was founded by Charles Pathe and his brothers. They were pioneers in the moving image industry and invented the cinema newsreel. French Pathe began in 1908 and in 1910 a newsreel office in London England was opened. The newsreels were silent until 1928, and over the years have captured and shown some remarkable footage to audiences in the cinema. Joy’s, triumphs and tragedies were shown within the news reels and historic events from the decades were captured on film are now archived for modern audiences to view. The footage recorded for the newsreels helped keep the cinema going audiences informed on what was going on in the world and provided a deeper insight than was sometimes available only through the newspapers or radio broadcasts. By the 1930’s British Pathe not only covered news items for the cinema audience but also entertainment, sports and culture. Over the years Pathe has changed hands of ownership several times until 1970 when it stopped producing cinema newsreels. Archive footage from the Pathe cinema newsreels can still be viewed at the Pathe news website. Other popular newsreel producers included British Movie Tone News which made the first of the sound newsreels for cinemas in 1929, and Gaumont British news which ended newsreel production in 1956 and evolved to create the colour cinemagazine series shown at cinemas from 1959 called Look at Life.